Travis Hoover was born on September 21, 1917 in Melrose, New Mexico. He enlisted in the California Army National Guard on November 9, 1938, and entered the Aviation Cadet Program of the Army Air Corps on August 9, 1939. 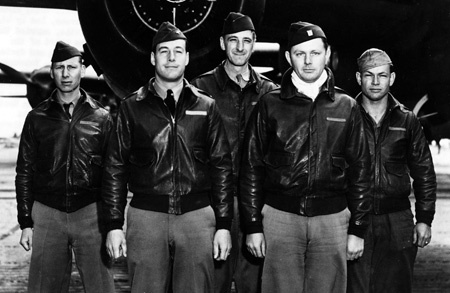 Hoover was commissioned and awarded his pilot wings on May 12, 1940, and became a B-25 Mitchell pilot. Lt Hoover was the pilot on the second B-25 to take off from the aircraft carrier USS Hornet on April 18, 1942, and after bombing Tokyo his crew flew to China and crash landed with no injuries. Hoover later flew combat missions in B-25 Mitchell and B-24 Liberator bombers and P-38 Lightning fighters in North Africa and Italy. Hoover remained on active duty after the war and served as the Commander of the 6351st Fighter Wing at Naha AB, Okinawa, during the Korean War. 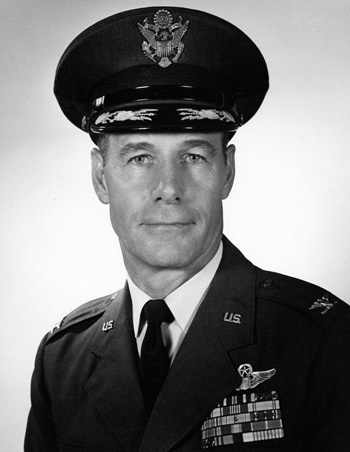 After completing a service school at the Air University at Maxell AFB, Alabama, Col Hoover served as Commander of the 3500th Pilot Training Group at Reese AFB, Texas, from February 1956 to July 1959, when he became the Deputy Commander of the 3500th Pilot Training Wing at Reese. He served in this position until September 1959 when he became the Deputy Commander of the 3610th Navigator Training Wing at Harlingen AFB, Texas. In November 1961 Col Hoover was assigned as the Commander of the 7216th Air Base Group at Incirlik AB, Turkey. 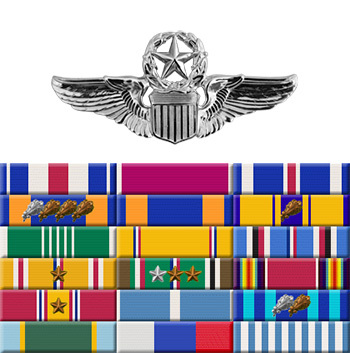 He served in this position until June 1963 when he became Director of the Resources and Requirements Directorate, the Training Standards and Evaluation Directorate, and the Electronic Systems Training Directorate under the Deputy Chief of Staff for Technical Training at Headquarters Air Training Command. Col Hoover's final assignment was as Commander of the 3380th Technical Training Squadron at Keesler AFB, Mississippi, from May 1966 until his retirement from the Air Force on October 31, 1969. Travis Hoover died on January 17, 2004.